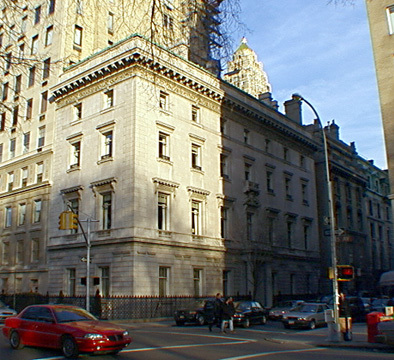 One of the great surviving mansions of "Millionaire's Row" on Fifth Avenue this impressive Italian Renaissance-palazzo-style building was erected in 1909 by Stephen Harkness as a wedding gift for his son and daughter-in-law, Edward and Mary Harkness. Stephen Harkness was a partner in Standard Oil. The elegant building was designed by Hale & Rogers. 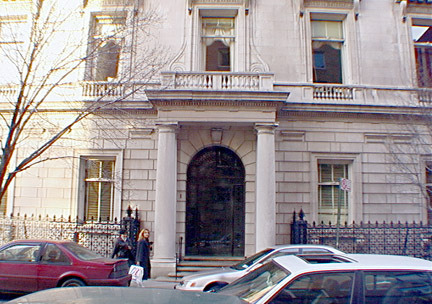 In 1918, the building became the headquarters of the Commonwealth Fund, a foundation set up by Mrs. Stephen Harkness. "Although deceptively simple overall, this is a sophisticated work, with carefully placed ornamental highlights. Little expense was spared in creating a lavish house; it is clad in white marble and protected by an extraordinary fence that is a masterwork of wrought-iron art. When the 1910 census enumerator came to the Harkness House, the family was not in residence; however, there were eight servants living here, all of whom were Swedish. This appears to reflect an ethnic bias on the part of New York's wealthiest residents who often sought out white Protestant servants, especially those from England, Scotland, and Scandinavia. Although Edward Harkness was involved in railroad financing and served as a director of several railroad companies, his primary interest was the distribution of his vast inherited wealth; he inherited so much money in 1926 he paid the sixth largest income tax in the country - $1,531,708! Harkness apparently established an excellent rapport with architect James Gamble Rogers during the design and construction of this house, since Rogers became the architect of many of the buildings financed by Harkness, including Butler Library at Columbia University, the original buildings of the Columbia-Presbyterian Medical Center, and the Harkness Memorial Quadrangle and Tower at Yale." "The exterior of the restrained, Neo-Renaissance house is of Tennessee marble, with granite and terra-cotta trim. The facade is only a facade, a curtain wall covering a steel post-and-lintel system. Rogers solved some problems in interesting ways. He secured privacy for the first floor by raising the window sills above eye level as seen from the street. He installed leaded windows to bring light into the east end and into the core of the building while blocking unsightly views. For more light, he put a leaded dome atop the stair balcony and one over the vestibule, installing electric lights in the plenums. And to help the Harkness family save on electric bills, he designed a refrigerator room in the basement that opened onto the moat. When the temperature dipped low enough, the door was opened so the power could be turned off. Not all was economical. The walls of the entrance vestibule are wainscoted with Botticino marble, and under foot is an intricate pattern of different marbles with a brass wreath set into the floor. The reception room fills the west end of the house and overlooks the park; ladies' and gentlemen's dressing rooms are off the reception hall in the center; and the dining room fills the east end, with a butler's pantry next door that was outfitted with a warmer oven and a refrigerator. This was the dark end of the house, so Rogers had Kenyon Cox design leaded windows to represent the Abundance of the Sea and the Abundance of the Land. The second floor had only three rooms. The music room was above the dining room, and like it, had leaded windows to light the as end. Overlooking the side street was the salon, with a recirculating fountain installed in a corner. And overlooking the park was the library, with a coffered wood ceiling painted in Italian arabesques in gold leaf. The third floor housed Edward Harkness's chamber, Mrs. Harkness's boudoir, his and her Mosler safes, a dressing room, a few bathrooms, and rooms for a maid and valet. The fourth floor was occupied by five chambers, a sewing room, and more servants' rooms. "